A lot believe hospitality jobs are great. A lot hate it. Few love the diversity while few hate the work routine. For some it’s fashionable and for some it is monotonous. In this post, we will try and provide answers to the following questions. 1. Why work in the hospitality industry? 2. Why hospitality jobs are great and what are the benefits of hospitality jobs? It’s time for a little self-promotion before we proceed. If you are a hospitality job seeker, make your way to our job search section to find from thousands of available hospitality jobs. Fresh jobs are being added regularly directly by hospitality recruiters and old jobs get weeded out. Now back to the topic in hand about why the Hospitality jobs are great and why is hospitality management a career option. Agree or not, we must admit that Hospitality jobs are different. Few rise through the ranks in a jiffy while a lot crave for promotions. A lot compare hospitality jobs with the army; you hate it but still like to be here. Whatever may be the reason, hospitality jobs are in high demand and the demand is increasing day by day. Hotel management is indeed a great career option and we have listed a few of the reasons that make hospitality jobs awesome. We might not give exact answers to the questions posed above but what we intend to do is to point to the positives of the hospitality industry. So let’s leave the negative things for later and talk about why hospitality jobs are great. While the word hospitality has always been a positive moniker for positivity and liveliness, you may not have previously thought much of it for a career. 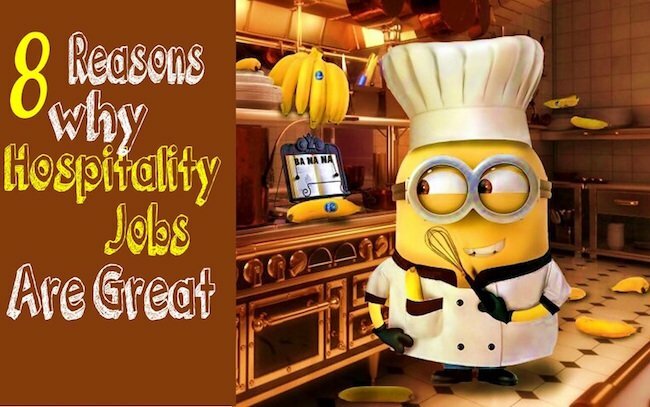 Here are just 8 of the many reasons why hospitality jobs are great! Your business is all about working for the people! Whether you are on the floor as a concierge or working with spreadsheets upstairs you always have the chance to brighten the day of every person that walks through the establishment. So you are an ambassador of positivity and make lives of other beautiful. According to several pieces of research about the hospitality industry, after salary, satisfaction is the most important criterion for great jobs. So, you are the smile ambassadors out there and if you have a decent salary, there can’t be a better industry than the hospitality industry. So research your options and prospective employer and it can be one of the best experience at work. If you are planning a career in hospitality, it is also nice to be aware of the best paid hospitality jobs. If you are made for this industry, you would be able to find many reasons to choose a career in the hospitality industry. Do you like variety? Do you like the fresh environment of every day being different than the last? Hospitality industry and especially the hotel industry and restaurant industry has an unorthodox schedule. While you might miss the weekends but you would always have an option to customise your work schedule. Opt for a morning shift if you are a morning bird and request a late shift if you are a night owl. If you want to break the monotonous cycle of waking up every day at the same time to do the same work and hit the same traffic rush on the way home then hospitality is a perfect fit for your lifestyle! The variety of schedules from each week can create the fun kind of hectic work that can get you out of that day-to-day funk you don’t even know you’re in. There are some downsides to this flexibility as most of you in the industry already know. Look at the funny pictures of hospitality to get more idea about both sides of the coin. Hospitality jobs are Easy to start! If you are a fresher or a college student then you know now the answer to this question; why work in the hospitality industry? It has jobs from A-Z which means a college student to a scientist all is a part of this industry. You can start wherever you want. The huge expanse of the industry allows you to enter the midway of the career as well. So if you are changing industries, hospitality is a safe bet. You may ask, especially as a young adult, why work in the hospitality industry? Well, quite honestly you probably meet the qualifications! Have a great attitude and love being around like minded and fun loving friends?! You’re perfect. The few training tips you will need are readily available all around the world. You may think the benefits do not factor into this career and you are wrong! The benefits for hospitality jobs reach across the wide spectrum from fantastic meals to 401k, or even exchanging words with celebrities to the dental plan. As you move up the ladder it only gets better. While it’s not highly paid at the lower level there is no better industry than hospitality to scale up your career exponentially. Some employers speak the line when you’re here, you’re family. While we cannot attest to their words, we can say it’s at home here. You stay in this line of work for the joy you get out of it. When people that are there for the same reason surround you, you begin to miss them when you leave for the day. The friends you made here with stick around for rest of your lives. The hospitality industry is vast but so well connected that you will meet your friends and colleagues multiple time in your career and you feel at home even when you join a new job. Your best friend might be escorting you to the first-day training session. You compete, enjoy and argue but stay like a unit. You may start as a concierge. You see how much fun the front desk can be too so you work a couple of shifts over there. If that begins to run its course for you there are receptionist jobs and management for the rooms or even booking that you can move on to. No need to find a new employer when you get in a rut. Just look around and find what suits you best! So if you are one of those creative people who can’t get enough at work, this industry gives you enough options to fiddle around without changing career. You are spoilt for options once you deside to choose a career in the hospitality industry. You will always have options to move within or outside the industry and this makes hospitality jobs great. 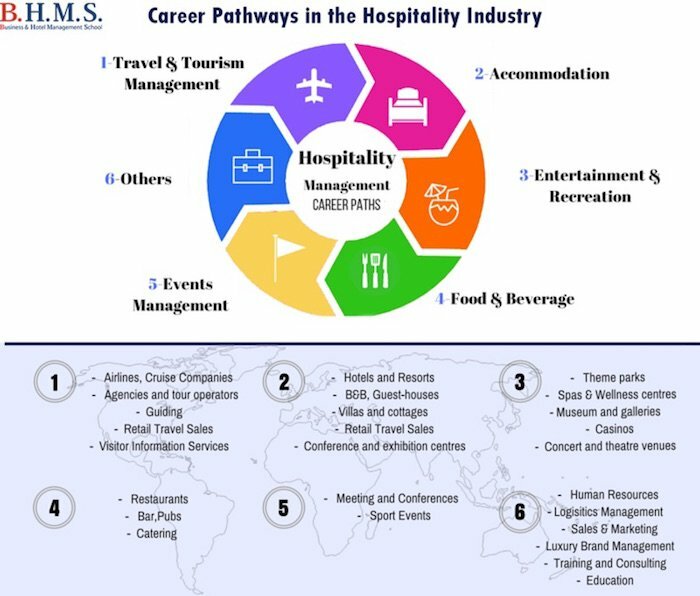 The below image by BHMS gives the career pathways hotel management professionals have. Hospitality jobs have truly stood the test of time. People will always need a place to stay. We provide a bed surrounded by an inviting atmosphere with food and refreshments and you can guarantee a long standing business. So, in a way when the world fights the recession, hospitality people are still being hired. Need some pieces of evidence. You might be perturbed due to a few people who would say not so positive things about the hospitality industry. Read this article which busts the myths about hotel and hospitality industry and gives the correct facts. Add another pinch of motivation by going through the list of astonishing facts about the hospitality industry . According to a report from STR Global in 2012, there are over 187,000 hotels in the world with 17.5 million rooms to be serviced! You can move to any city, town or small suburbia and find a job looking for your experience. The world opens up with the scope of the hospitality industry. This is not all. the world is turning towards the hospitality industry. Future of hospitality industry is bright and it is said that 1 in 10 people would be employed by hospitality industry in a couple of decades.